For aging adults who live independently, adjusting their home environment for reasons of safety or accessibility can feel like an admission of defeat. However, putting off such improvements exposes aging individuals to greater risk of even more serious injuries — the kind that threaten the very self-sufficiency they are protecting. Rather than ignoring the changing needs and capabilities that often come with age, the best way to preserve independence and continue aging in place is to welcome these alterations as a way to stay safely at home. For caregivers looking to improve the safety of a loved one’s home, the bathroom is a smart place to start. Specifically, the Centers for Disease Control once named the shower as the number-one location of home injuries. Fortunately, a wide spectrum of improvements can increase accessibility in of one of the most hazardous areas of the home. Read on to learn about DIY options for a range of skill levels. Long-term ease of use doesn’t necessarily require a complete remodel. Even a few mild tweaks can render a shower markedly safer. Replace a fixed shower head with a hand-held model. Adding a hand-held shower head on a hose means less bending and awkward positioning for the bather. A shower head with adjustable height lends further flexibility, making it possible to reach the handle from a seated position. Add a reliable shower seat Some are wall-mounted for durability, some fold down to save space, some are incredibly adjustable. The right choice will be a comfortable height and not only provide adequate support during use, but also permit the bather to easily sit down on/stand up from the seat. Ensure traction with non-slip safeguards on all floors. In the shower or tub itself, resilient non-slip mats or strips are a simple addition. If shifting mats are a concern or total coverage is desired, there are kits that add a non-slip film to slick surfaces; look for them at hardware stores. Outside the shower, bathroom rugs should be rubber-backed or held in place with two-sided carpet tape. Upgrade shower door thresholds. Showers with full-length doors (not tubs) are often paired with metal barriers that prevent water from seeping out; however, the requirement to step over may prohibit bathers with limited mobility. A collapsible water retainer (or “shower dam”) performs the same function, but is designed to crumple or fold, allowing wheelchairs easy passage. However much we reduce the risk of slipping, there’s no way to eliminate it altogether. This is why grab bars are a bather’s best friend — no other modification so plainly addresses the very real possibility that he or she might slip and need immediate stabilization. Experienced home improvers shouldn’t be put off by the project’s degree of difficulty; for beginners, online tutorials and videos are plentiful. Durability is king. Although the two may look similar, a towel bar doesn’t have the durability of a true grab bar, and could pull out of the wall when it’s needed most. When shopping, look for bars that are compliant with the specifications of the Americans with Disabilities Act (ADA). Check with the experts. The ADA also gives specific directives for grab bar placement in different applications. Placement may be tailored to the individual for personal use, but familiarity with the prescribed instructions may help avoid some treacherous trial and error. Follow through. When it comes to fall prevention, ‘good enough’ is no good. To be sturdy enough to support a bather’s weight, grab bars must be securely fastened to wall studs or proper mounting flanges; in some cases, a wall may need additional reinforcement. Look to the internet for resources, such as this wikiHow guide, if you have a specific issue you need to troubleshoot. Although smaller changes might be enough for right now or the near future, at some point, the entire shower may need an overhaul. But before taking on a project of this magnitude, put down the sledgehammer and think the job through. How big is big enough? An optimally accessible shower may require a substantially larger footprint than the unit it’s replacing. Ideally, a barrier-free (sometimes called “curbless”) shower should have dimensions of at least 3’x4’. If the bather will require assistance, plan for at least a 5’x5’ space. Replace or remodel? Because of the unique drainage considerations of a barrier-free shower, the project may call for substantial changes to the subflooring and/or drain. Other plumbing demands may also arise, such as moving faucet controls to a height and location where they can be comfortably reached by the bather from outside the shower. What’s missing? Whether there’s insufficient chair-height shelf space or a small obstruction to a swinging glass door, there are few disappointments greater than finishing a demanding home improvement project and finding something wrong, out of place, or purely unanticipated. When it comes down to it, an expertly accessible home shower makeover may be best left to an expert, such as a contractor with experience in accessible home construction and/or specific training in ADA compliance. 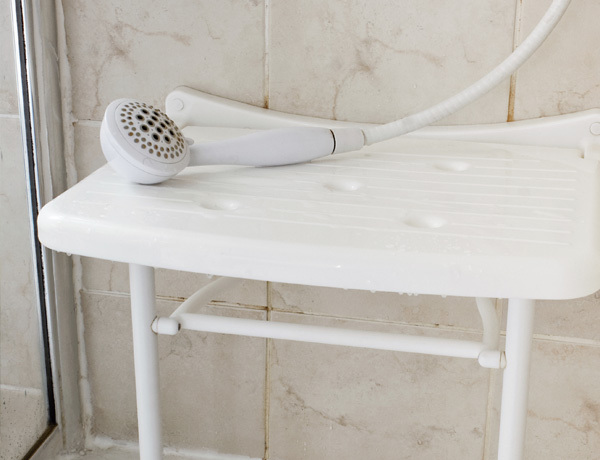 No matter whether it’s time to pull out the stud finder and drill, or simply buy a better bath mat, it is never too soon to take some action toward a safer shower. With a little foresight, being proactive in the home may help you or your loved one remain happy and secure in the months and years to come.